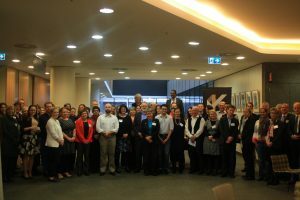 110 people from around Australia and overseas attended a day-long workshop on 27th June devoted to the interaction between people with a brain injury and the criminal justice system, held in partnership with UNSW Australia’s Australian Centre of Research Excellence in Offender Health. The agenda is here. The consequences of brain injury for psychological and physical well-being, for thinking and behaviour may increase the risk of offending and as many as 70 per cent of adult prisoners report a history of traumatic brain injury. However, brain injury receives relatively little recognition throughout the criminal justice system. Together with high-level local representation from health, the police, judiciary, juvenile justice and adult corrections (participants include the Chief Magistrate of New South Wales His Honour Judge Graeme Henson and Queensland Corrective Services Commissioner, Mark Rallings) Brain Injury Australia was honoured to welcome Professor Lyn Turkstra from University of Wisconsin-Madison – an international expert on cognitive rehabilitation for adolescents and adults with brain injury – and The Honorable Judge Eugene M. Hyman from the Superior Court of California, County of Santa Clara – who presided over the first family violence court in the United States, and helped create the field of “therapeutic jurisprudence”, that advocates services and supports for particular categories of offenders, including people with a disability. A final report from the workshop, with recommendations, is here.